I just finished doing a shoot for a newborn baby girl. The session went great since the little one literately slept like a baby. The set up was quite simple, I used a photography posing table to set the basket with the baby, that made it easy for moving and positioning. 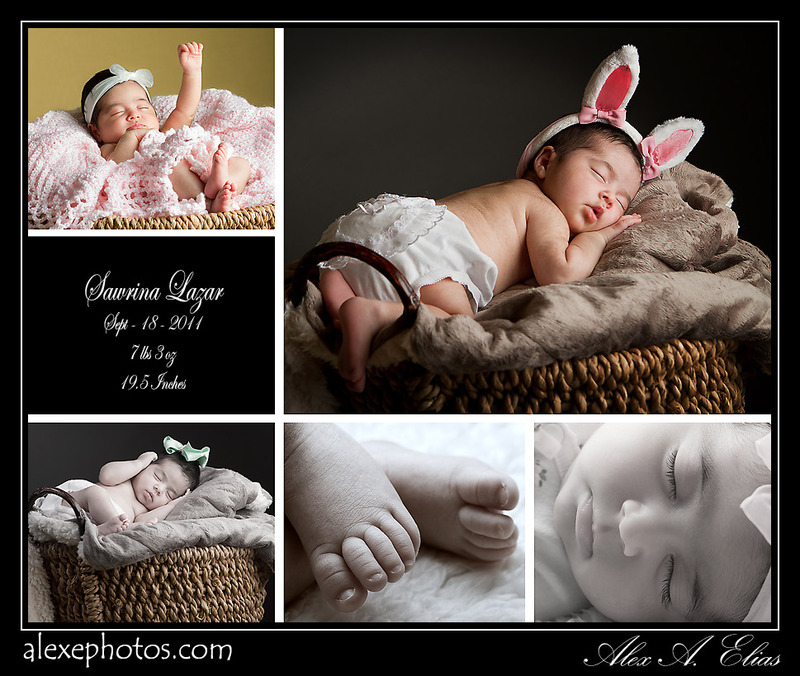 The lighting was done with 2 Travelites 750 one with a 11″ reflector set with a 30Deg grid for the background and the other one with a larger Photoflex softbox that was placed very close to the baby on camera’s right. On the left side of the camera as a fill light I used a Canon 580EXII with a 2×2 Lastolite softbox . All lights were triggered with Pocket Wizards Flex TT5 and a Pocket Wizard mini TT1 with the AC3 controller on the camera as the master. The camera was a Canon 7D and the two lenses for this shoot were a Canon Ef 100 macro F2.8 and as Canon Ef 24-70 f2.8L. I used the 100 macro 90% of the time for the session. I set it at f5.6 since I was looking for a rather shallower DOP. For the post work I used Adobe Bridge to organize and tag the files with colors and stars. From there I migrated the raw files to ACR to do some adjustments and then open in Photoshop CS5 to do the last part. Here I did a few different styles in terms of post work from color, to black and white, duo tones and playing with vibrance and saturation tools. I welcome questions and suggestions. This entry was posted in Kids, Photo of the day, Photo tips, Portraits and tagged alex elias, black and white, Canon 7d, Kids pictures, lighting set up, pocket wizard, portraits, Travelite 750. Bookmark the permalink.